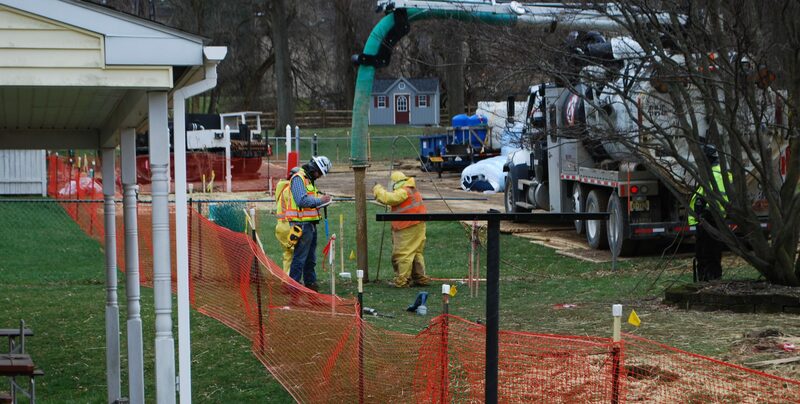 In this photo from May 2018, pipeline workers probe the ground on Lisa Drive in West Whiteland Township where sinkholes have developed as a result of the Mariner East 2 construction. A worst-case explosion of the Mariner East 2 pipeline in Delaware County would kill anyone within about a mile of the rupture, a new report says, but it concludes the chances of someone dying from a pipeline incident are less than that of dying in a car crash or from falling down stairs. The report says that a flammable vapor cloud could extend 1.3 miles downwind from the point of a full rupture, and calculated that there was a 100 percent probability of dying from a blast over a certain intensity for everyone within a mile radius, whether they were outdoors or indoors. And it said the chances of a natural gas liquids leak igniting from the Sunoco pipeline are higher in a densely populated area like Delaware County than they would be in a rural area, because of the higher number of potential ignition sources like cars, cellphones or doorbells. The size and direction of a flammable vapor cloud would depend on wind speed and atmospheric stability, the report said. “The dispersing flammable cloud could ignite at any point in time and the time of ignition, with respect to the changing size of the flammable cloud means that the resulting consequence can vary greatly,” said the report, written for Delaware County Council by G2 Integrated Solutions, an independent consultant. The report also assessed the risk of the proposed conversion of a 50-mile section of the existing Adelphia pipeline from oil to natural gas, and concluded that its risk was in the same category as Mariner East 2. Delaware County hosts about 11 miles of ME2 and 12 miles of Adelphia. Worries about ME2’s safety have been fueled by a long series of drilling-fluid spills and geological problems since the multibillion-dollar pipeline started construction in February 2017, prompting state regulators to issue dozens of violations. Federal data show Sunoco with the second-highest number of pipeline incidents in the industry. Despite its grim predictions, the study concluded that the risk of fatality from such a pipeline incident was in the same category as common sources of risk facing the general population daily. But pipeline safety campaigners rejected the comparison with common sources of risk such as cars, saying that the new report understates the actual risk by ignoring the fact that the Mariner East project will consist of three pipes of different diameters, representing at least a doubling of the risk. Activists also noted that the report is based on risk to individuals, and did not consider the schools that the pipeline will run near, whose concentration of students would have increased the calculated risk, they said. Sunoco, a unit of Energy Transfer, said the report vindicates its argument that the pipeline is safe, and questioned why the council decided to spend more than $100,000 of taxpayers’ money to have a consultant reach that conclusion. Spokeswoman Lisa Dillinger said the actual risk level is lower than stated because the calculations are based on the hypothetical example of an individual standing directly over the pipeline 24 hours a day, seven days a week. The report said that the average person’s exposure to a fatal traffic accident is about 20 times greater than the fatality risk to someone standing above the pipeline 24/7. The 74-page report, released last week, is the second risk study on the pipeline to be commissioned by safety campaigners or public officials in Philadelphia’s western suburbs this year. In August, pipeline activists released a “Citizens Risk Assessment” in which Quest, another consultant, made its own calculations on the vulnerability of residents in Delaware and Chester counties to any leak or explosion from the controversial line. Quest’s estimate of the size of a flammable cloud was about a third of that calculated in the new report, a gap that activists attributed to the different modeling software used by the two companies. Brian Zidek, a Delaware County councilman, said the report contained elements that would please both sides of the pipeline debate, and was broadly in line with the Quest study. But he defended the council’s decision to spend $115,000 on the new report, which he said adds to citizens’ understanding of the project’s risks. “We have now two data sources that quantify the risk posed by the Mariner East pipeline, and being able to quantify that risk is useful for citizens, for first responders, and for any government agency having to deal with this,” he said. Zidek, one of two Democrats on the Republican-controlled council, said G2 will present the study to the public at an event sometime before the end of the year. He said it should be read by the Public Utility Commission, as the state agency with authority over pipeline safety. Colleen Morrone, the Republican vice-chair of the council, did not return a phone call seeking comment. Despite its differences with the Quest study, activists said the new report underlines the dangers of running the pipeline through a densely populated area like Delaware County. “It is now abundantly clear that the rupture of a hazardous, highly volatile liquids transmission pipeline in Delaware County is going to be a mass casualty event. And the odds of this happening are disturbingly high,” said the citizens’ group Del-Chesco United for Pipeline Safety, in a statement. State Sen. Andy Dinniman, a Chester County Democrat who is an outspoken opponent of the Mariner East project, said both studies help the public to understand pipeline risks after the Wolf administration declined to do its own assessment. “Our communities are only as safe as what we know about this project and what we’re finding out is that our residents are not only rightfully concerned, but these concerns are far more serious than previously thought,” Dinniman said in a statement. But pipeline advocates dismissed the new report as a last-ditch attempt to derail the project, which Sunoco says will begin operating before the end of the year. “Living near the Mariner East lines is actually safer than driving a car, and this report confirms that local residents needn’t fear this critically important infrastructure project that will deliver significant economic benefits to Pennsylvanians for years to come,” said Kurt Knaus, a spokesman for the Pennsylvania Energy Infrastructure Alliance. When operational, Mariner East 2 will carry natural gas liquids about 300 miles across the state to a terminal at Marcus Hook in Delaware County where most of it will be exported to Scotland for making plastics.